The word intention has it’s roots in the Latin Intendere (intend). To intend something is to ‘direct the attention to.’ Our attention is directed by both our conscious and unconscious minds. Unconsciously, our drives, instincts and impulses have a direction with some rooted deep in our psyche’s and part of our genetic programming. Sometimes we do things that we did not consciously direct. We express our sexuality through our unconscious body movements. This is due to our instinctual nature and it is prevalent throughout our lives. Consciously, we direct our attention to what we decide is important in a given moment and over extended periods of time. As the time horizon moves out there are thresholds of intent. Our decisions and actions affect the present moment. How we manage our resources affect how we are able to meet our goals. How we operate over the long-term enables us to obtain the objectives supporting the vision we direct ourselves to. 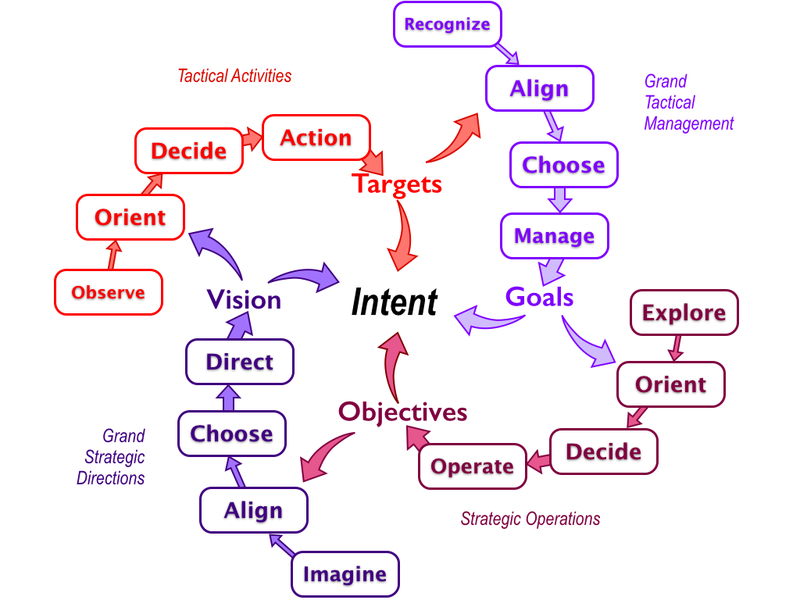 These four levels of intent: targeted activities, goals management, objectives and vision all relate to our intent. Our intent is the interweaving of unconsciously driven choices and our consciously generated decisions. When we allow ourselves to observe, recognize, explore and imagine these four levels of intent a four-fold mandala of intent becomes evident. Whether we are aware of our intent over the longer periods or not, we express this mandala over time throughout our lives. My eight-year old daughter expresses this even though she doesn’t think in these terms. She’s learning to focus by directing her attention on her math problems at least once a day. Doing so, she uses her actions to hit her target of completing so many practice sessions and quizzes. She manages her resources, specifically her time, to make sure she meets her goal of doing it every day. Her objective is to get a score of a 100 so that she can take part in a celebratory lunch with those in her class who make it to that level. And, her vision is to complete third grade with better than satisfactory scores. Our awareness and time scales vary depending on our vision, objectives, goals and targets, but we all express this four-fold intent in our lives through what we do. What we do expresses our intention. Our plans for the future set our intentions in motion. What we do expresses our Intent. Our plans set our intention in motion.